Exit 25 Tienen, towards the centre, ring-road Tienen. Exit Oplinter, through the city centre of Oplinter, pass the church (right lane). 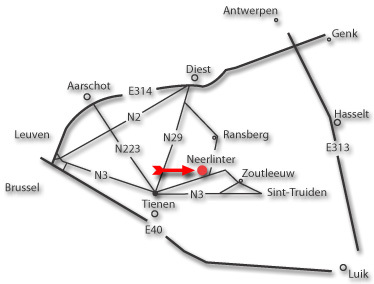 You will reach Neerlinter and can follow the signposts. Exit 24 Bekkevoort, turn right after 200m towards Leuven, then approach E314 towards Maastricht and immediately turn right towards Tienen. In Tienen, on the ring-road, you take the exit Oplinter and follow above described directions. Exit 24 Bekkevoort, turn left towards Tienen. In Tienen, on the ring-road you take the exit towards Oplinter and follow above described directions.